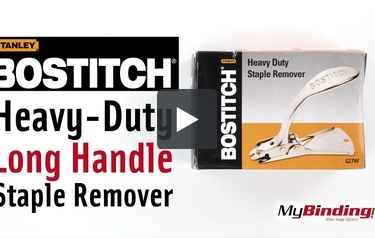 Heavy-duty staple remover is ideal for removing heavy carton staples in shipping and receiving departments. The G27W can easily remove heavy-duty staples from thicker documents. Tough, all-metal construction delivers a lifetime of superior quality and performance. The wear-resistant, nickel-plated finish provides long-lasting, polished professional appearance. Built-in staple shield helps protect you against staple hazardous kickbacks. Staple remover also acts as a handy pocket clip to keep the stapler close at hand. Dimensions (H x W x L): 2.1" x 5.3" x 3.5"